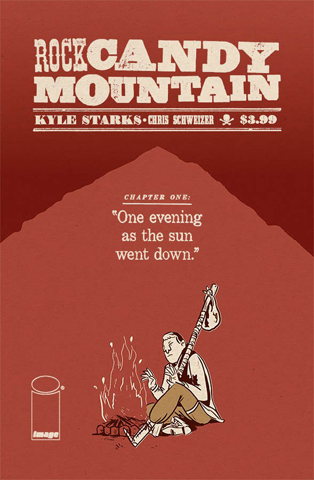 Rock Candy Mountain # 1 begins with the Devil violently tearing apart a hobo camp looking for our main character, Jackson. His reason for such a bloody and ruthless search isn’t all that clear from the get go, but it probably has something to do with Jackon’s search for the mythical land of cigarette trees or lakes of stew and whiskey too. The action then moves to Jackson hopping onto a train and helping a fellow traveler get on said train. Starks spends the issue building this post-WWII Hobo landscape. Jackson’s a noble loner of an action hero and his new friend, Hollywood Slim, is as bewildered as he is fascinated by Jackson’s world of rail-hopping and punching. Starks’ blend of action, humor and fluid cartooning weave a hobo tale the likes of which we haven’t seen before. I mean, the Devil punches a hobo’s head off on page one. Page one! So what are you waiting for, Dear Reader? 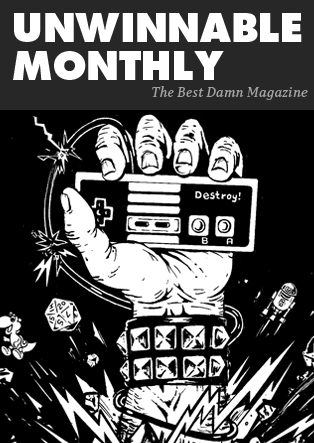 Go read Rock Candy Mountain # 1! 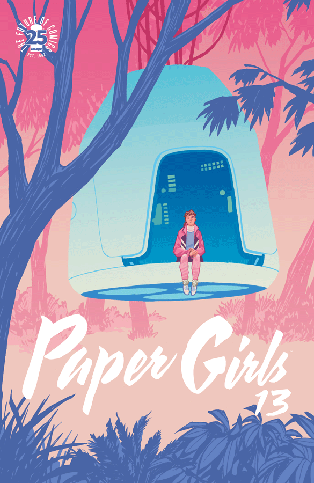 I came to the latest issue of Paper Girls with a bit of trepidation – the book’s mysteries keep coming fast and furious, and while the focused character beats have been enough to keep me fully engaged until now, I was worried that we’d have yet another issue with way more questions than answers. It turns out, unsurprisingly, there was never any cause for concern. Talk about a straight shooter! It’s no small feat to make new characters so likable and/or interesting so quickly, something Vaughan does on the regular in Paper Girls. Wari is proving not only to be a valuable ally for our twentieth-century group, but also a nuanced portrait of another kind of twelve-year-old’s experience. A harsher, more violent one, and one that feels not so very far in the past, despite her home being set in the Pleistocene period. Indeed, in this issue’s solving of one of the series’ most tenacious mysteries (how are these past humans in possession of future technologies and vocabulary? ), we find out – in this world, at least – past, present, and future humans are closer to each other than any of them ever imagined, due in part to tiny tears in the fabric of time which allow future civilizations to dump “useless” technology millions of years into the past. In a thrilling sequence, we discover people in the past can deliver things into the future, too, as Erin hastily carves a now familiar message into KJ’s field hockey stick and drops it through a quickly-closing time-rip into a darkened mall in twentieth-century Stony Brook. Much, much more happens in issue #13 of Paper Girls, including some major character development for Mac and KJ, but this series is too good to give all the story beats away – I guess you’ll just have to pick it up and read for yourself. 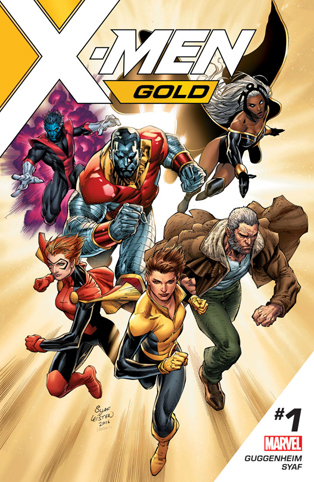 After everything the X-Men have been through, X-Men Gold #1 feels like an attempt to right the ship and getting this franchise back on course. This ship is rickety though, and may not be seaworthy for long. It also seems like a member of the crew won’t be around for long due to some ugly beliefs and an urge to air those beliefs in his comic book. It’s not a bad comic, an ok first issue introduction, but where it will go from here is up in the air. There’s solid action in this issue, humans hating or mistrusting mutants, X-Men playing baseball, some comedy and a new version of a classic villainous team in this issue. It’s a nice blend, although at times it’s apparent that writer Marc Guggenheim really wants you to like this. I get it, while many still buy X-comics there’s a lot of people like me who are turned off to the recent direction of the X-Men comics, and it’s a herculean task to get people on board again after the disasterous and most likely company-mandated direction the comic franchise has taken in the last 8 years or so. For a while that mandate seemed to be bleed the franchise dry, and to not present anything new in the character or ideas department, unless Fox were to get their hands on it and profit. The story in this issue is classic X-Men with a twist though, that twist being that the student finally becomes the teacher. Kitty Pryde’s great in the leadership role. It’s refreshing to see a character in a Marvel comic, or any Big Two comic, go through organic growth from early teens to adulthood, and learn to take on their great responsibility while also evolving as characters. Let’s hope it sticks and some future writer doesn’t make her 15 and naïve again in a few years. What also doesn’t feel organic is her and Old Man Logan bonding. Didn’t this version of Wolverine kill her in his reality, along with the rest of the X-Men? It’s just so dumb that they went through this whole convoluted and interdimensional gobbledy-gook just to naturally age Logan another couple decades. Their interaction rang hollow. Something else that rang hollow and left a stink is the artwork of Ardian Syaf. There are moments where it’s effective, but it mostly looks unfinished and flat. Not to mention the current controversy that Syaf tackily hid some of his political beliefs into his comic, including some that can be interpreted as anti-Christian and anti-Jewish. Rather than make this a long-winded recap of the controversy simply Google ‘X-Men Gold Controversy’ to find out the details. I guess I shouldn’t get used to the art as Syaf will most likely be removed from the book eventually, but all in all it was low and petty of him to sneak images that can be linked to hate groups into this issue. Tolerance and diversity are two of the big themes in X-Men, not to mention that Kitty Pryde is a proudly Jewish character. The X-Men are heroes again, something we’ve seen before until they’re pulled down in the dirt and exiled. For something that is being touted as a return to form to what was one of Marvel’s biggest selling books this feels underwhelming, but I’ll see where it goes. There are ideas here that can go in great directions, but also the looming spectre of awful story-crushing blockbuster crossovers that hangs heavy over all the X-Titles always. Hopefully the character interactions remain solid, the stories are entertaining, the crossovers and hidden rotten politics stay away and someone gives Logan something to wear other than a t-shirt and a duster. C’mon, everyone else is wearing a colorful costume, even lend him Gambit’s pink armor from the 90’s if they want to keep the duster.